One of the joys of a few days away is finding a good bookshop. I have long regretted that Ryanair cabin baggage restrictions limit the number of books I can take back with me from visits throughout the year to Lichfield and Cambridge, or my regular visits to Greece. However, cabin baggage regulations did not apply when I travelled in the car of a friend and colleague for my retreat in Glenstal Abbey, Co Limerick, last week. 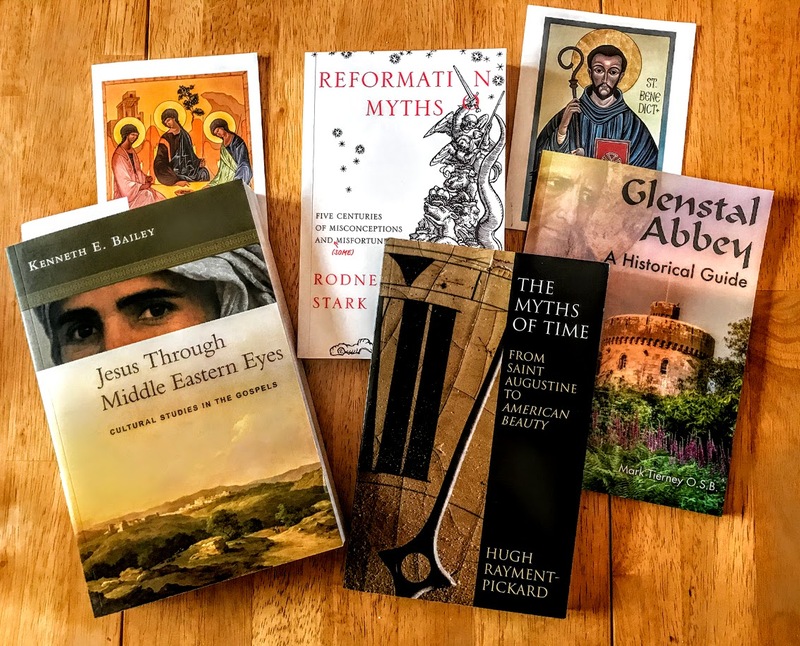 The shop in Glenstal Abbey is both theological and devotional, stocked with books from the best theological publishers across quite a broad range, as well as icons, cards and other devotional materials. I returned to the Rectory in Askeaton with four books from Glenstal Abbey that illustrate the theological range on the shelves of the shop. Rodney Stark is a professor in both Baylor University, Texas, and Peking University in Beijing. His Reformation Myths: Five Centuries of Misconceptions and (Some) Misfortunes (London: SPCK, 2017) was published last year to coincide with the 500th anniversary of Luther’s Reformation on 30 October 1517 … and he takes no hostages as he charges through five centuries of history. He begins by pointing out that there was not one single Reformation, but many reformations, with different principles and emphases, including Luther’s, Calvin’s, and the Anglicans, as well as the Anabaptists and others, which were contradictory and often mutually antagonistic. There is no one, single agreed or coherent definition of the word ‘Protestant,’ and the ‘average’ Protestant is a statistical fiction. Indeed, as he asserts, the differences make a nonsense of any ‘Protestant-Catholic’ comparisons. Stark is both stark and forthright in discussing Luther’s ‘venomous’ anti-Semitism and its dreadful impact in Nazi Germany. He agrees with Diarmaid MacCulloch that ‘Luther’s writing of 1543 is a blueprint for the Nazi’s Kristallnacht of 1938,’ when paramilitary Nazi forces smashed and burned Jewish synagogues, stores, hospitals, schools and homes throughout Germany and Austria on Luther’s birthday. He links the Reformation with the rise of nationalism in Europe, and sees the outworking of its consequences in World War I and World II. He challenges the myth of the ‘Protestant Ethic’ and the myth of the Protestant scientific ‘revolution,’ pointing to the many French, German, Italian, Dutch, Flemish and Polish scientists who were Catholics – to which he might have added the discoveries of Spanish and Portuguese explorers. A very different set of myth is examined by Hugh Rayment-Pickard in The Myths Time, From Saint Augustine to American Beauty (London: Darton, Longman and Todd, 2004). Hugh Rayment-Pickard is a parish priest in west London with a PhD in the philosophy of religion who has taught at Goldsmiths College, University of London. This book asks many questions I have been asking myself since I touched on the themes in this book in a sermon in Sidney Sussex College, Cambridge, on 5 February 2012, the Fifth Sunday in Ordinary Time. This is a stimulating examination of the theology of time and history, drawing from art, literature, philosophy, theology and reflections on everyday life to show how we experience time. He believes that time is given meaning by a cluster of basic myths about human destiny. Far from being an abstract singular concept, we view time in a complex, multi-layered way that has strong implications for how we behave and approach our lives. Kenneth E Bailey is both a Presbyterian minister and canon theologian in the Diocese of Pittsburgh in the Episcopal Church. He spent 40 years in the Middle East teaching New Testament studies, and is the author of many books in English and Arabic. In Jesus Through Middle Eastern Eyes, Cultural Studies in the Gospels (London: SPCK, 2008), he draws on his knowledge and experience of Middle Eastern culture to offer a deeper understanding of the person and significance of the Jesus of the Middle East. The book is helpfully divided into six sections: the Birth of Jesus, the Beatitudes, the Lord’s Prayer, the Dramatic Actions of Jesus, Jesus and Women, and the Parables of Jesus. He lifts away layers of modern Western interpretation to introduce Jesus in the light of his historical and cultural settings. Dom Mark Tierney, who died in Belgium almost six years ago [31 December 2011], was a notable liturgist and historian and a monk of Glenstal Abbey. His school textbooks, The birth of modern Ireland (with Margaret Mac Curtain, 1969) and Modern Ireland, 1850-1950 (1972), shaped the historical outlook of a generation of Irish schoolchildren. His preparation and publication of the calendar of the papers of Archbishop Croke was pioneering work, and his work on the Croke papers was crowned with his biography of Croke (1976). Later, he focused on the life of Columba Marmion, the Irish-born Abbot of Maredsous in Belgium who is a key figure in the story of the foundation of Glenstal Abbey. And so, Mark Tierney’s Glenstal Abbey: A Historical Guide (Glenstal Abbey Publications, 2018) is appropriate reading, not only as a guidebook, but as a way of catching up on the history of Glenstal that I missed out during my 24-hour retreat last week.